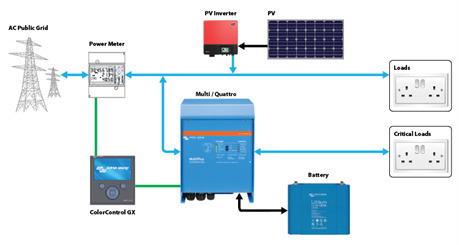 Victron MultiPlus inverter charger range. This equipment uses advanced technology to understand the flow of electricity. When you have excess PV generated energy. The victron multiplus can push this into a seperate battery storage for uses when required such as after dark. This can also be used in power cuts as critical loads can automatically utilise the UPS power stored in batteries as required.